In the Medieval era there was very changes occurred in Indian History. In this section we serve some most important multiple choice questions for these era i.e. Medieval Indian History Quiz. These questions are very helpful for those candidates who want to prepare for the various entarnce exams like UPSC, Bank Jobs, SSc, PSC, Police, Vyapam, CET, TET etc. 1. Which of the following saint wrote Sri-Bhasya? 2. Which Tamil poet wrote Ramayana in Tamil language? 3. Who was famously known as the Tuti-e-Hindustan? 4. Who established Chishti order in India? 5. Name of the Bengali poet who was conferred with the title of Gunraj Khan in the Sultanate period? 6. Brihadeeshwara Temple which was built by Raja RajaChola I is dedicated to? 7. During the reign of which Pallava ruler Ratha temples at Mahabalipuram were built? 8. Who built the famous Charminar of Hyderabad? 9. The seven pagodas of Mahabalipuram are a witness to the art patronised by the? 10. Which noted scholar wrote Vikramankadevacharita? 11. Who was the founder of Advaitavada or the doctrine of non-dualism? 12. Famous mosque Adhai Din Ka Jhonpra was built by which of the following ruler? 13. Which of the following Sikh Guru compiled the Adi Granth? 14. Kandariya Mahadeva Temple of the Medieval India is dedicated to which Lord? 15. Who was the author of the book Taj-ul-Maasir? 16. During the reign of which ruler Moroccan traveler Ibn Battuta visited India? 17. Who brought the famous Persian painter named KhwajaAbdus Samad to India? 18. Which book described the Arab invasion of Sindh for the very first time? 19. Who was the author of the book Kitab-i-Yamini? 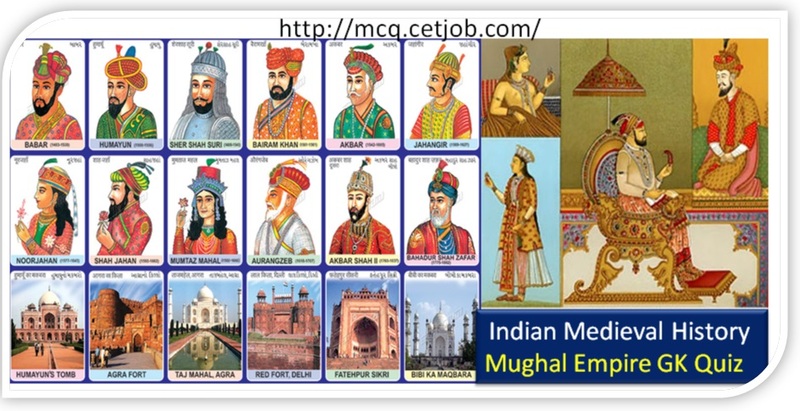 22. Who was the Mughal emperor at the time of Ahmad Shah Abdali's invasion of India? 23. Who was the last Mughal emperor to sit on the peacock throne? 24. Which one of the following was NOT introduced by Shivaji? 25. Who among the following took greater interest in laying out gardens than others? 27. Which one of the following indicates the correct chronological order of the Later Mughal Emperors? 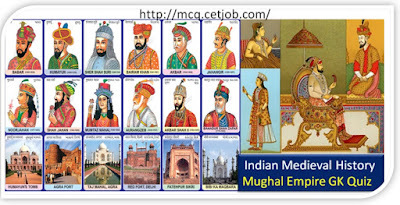 28. Who was the last Mughal emperor? 34. Who among the following was Akbar's teacher? 38. What is meant by Mughalai? 41. Assertion (A): The nobility under Muhammad bin Tughlaq was a highly homogeneous one. 42. Assertion (A): The invasions of Krishnadeva Raya into the territories of Prataparudra were inconclusive. Reason (R): Krishnadeva Raya invaded the territories of the Gajpathi not for the latter's extinction but only for the recovery of lost territories. 43. Assertion (A): Shivaji aimed at establishing Maratha rule in Delhi. Reason (R): Shivaji took the leadership of the Maratha resistance against the Mughals. 44. Assertion (A): Akbar claimed divinity for himself. Reason (R): He thought that in the country of many beliefs such as India, the sovereign should not be associated with anyone particular religion. 45. Assertion (A): Babar won the first Battle of Panipat. 46. Assertion (A): The BulandDarwaza at FatehpurSikri was built by Akbar in 1602. 47. Assertion (A): Alauddin Khalji imposed price control in Delhi. Reason (R): He wanted to pay lower wages to artisans building his palaces in Delhi. 48. Assertion (A): Wazir Nizam-ul-Mulk left Mughal Emperor Muhammad Shah to realize his own ambition of founding the State of Hyderabad. Reason (R): Muhammad Shah, instead of supporting his able Wazir, intrigued against him. 49. Assertion (A): Akbar's official historian AbulFazl neither gives the prices of slaves nor does he mention slave markets. Reason (R): Akbar prohibited slave trade in his empire. 50. Assertion (A): The Sultans may not have been too eager to encourage large scale conversion. Reason (R): The increasing conversion could lead to a loss of revenue, as jizya paying citizens to Islam.